BEFORE: Free-standing shelves and piles everywhere! 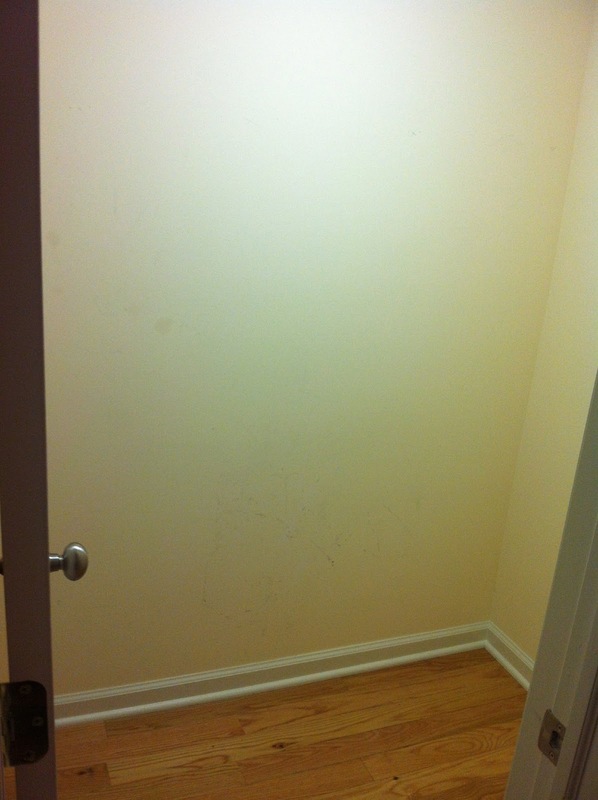 BEFORE: Lots of wasted space. I'm so excited to share our new kitchen pantry! 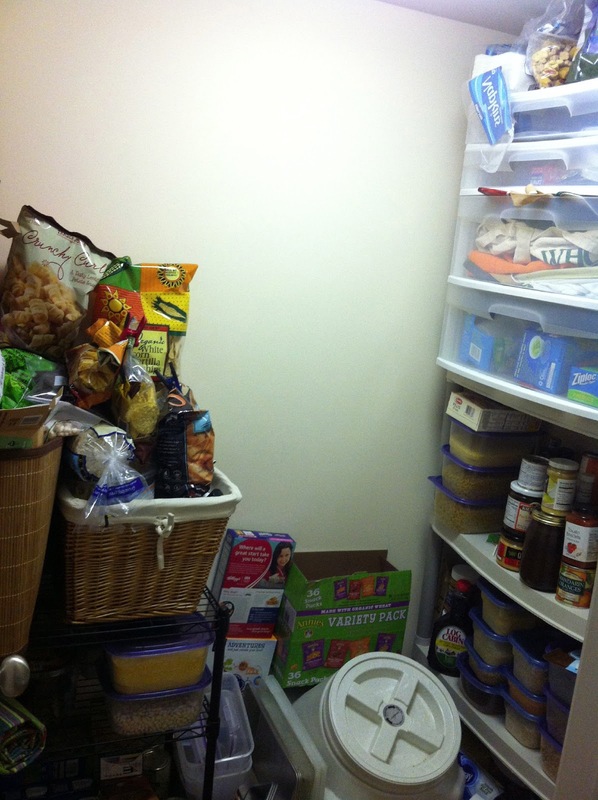 We moved into our house three years ago and I was thrilled to have a pantry after leaving our small condo in Chicago! When we moved in, we just put our free standing shelves inside and started piling things in it, with the intention to making built-in shelves in the future. I'm really thankful for Aaron's handy work and home project skills! 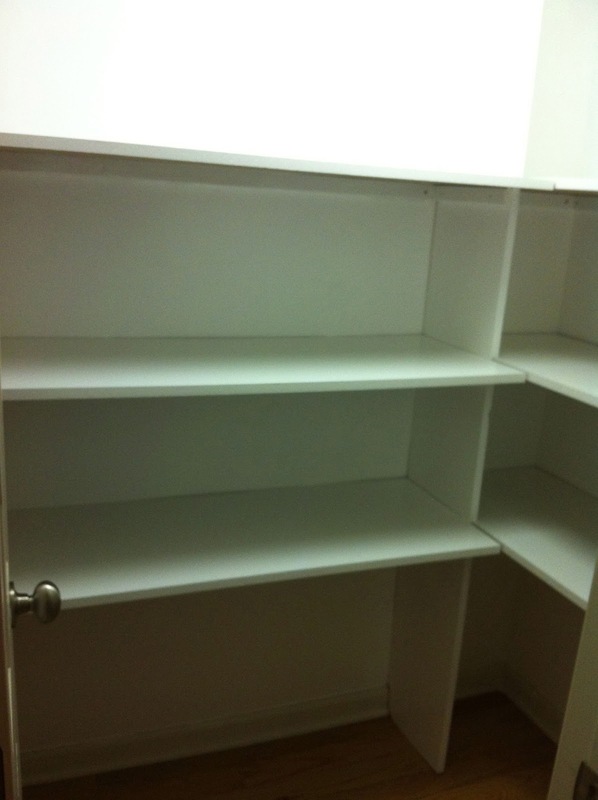 He took a few days off of work early in January and spent a couple days on our new kitchen pantry. It's made such a big difference! 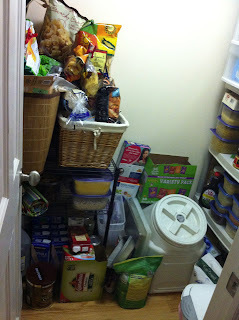 Our pantry is organized and everything is so accessible. I really like shopping in the bulk bins at Whole Foods for our whole grains, dried beans, seeds, and other ingredients, storing them in stacked plastic containers. In the past, I had trouble seeing and accessing everything and would buy something that I didn't need. 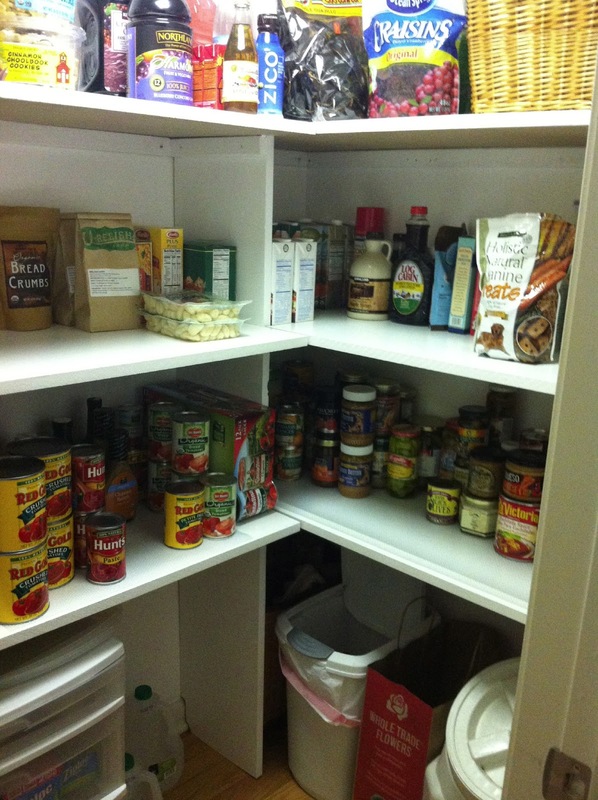 The new shelves make it so easy to see what we have stored in the pantry! Our Costco membership comes in handy for my bulk cooking for my freezer meals exchanges. It's nice to have extra room to store my larger items like brown rice and whole wheat flour! Here's how the project unfolded. Step 2: Building the shelf supports. Day 1: Planning/Unloading - After Aaron sketched out the plans, we removed everything out of the pantry and into the kitchen and living room. While we were dismantling, we threw out expired food to start with a clean slate. We had everything out for the several days while this project was underway. That evening, Aaron made a final shopping list of the building supplies he needed for the project. Day 2: Shopping/Painting - Aaron went to the store and bought building supplies such as paint and boards. 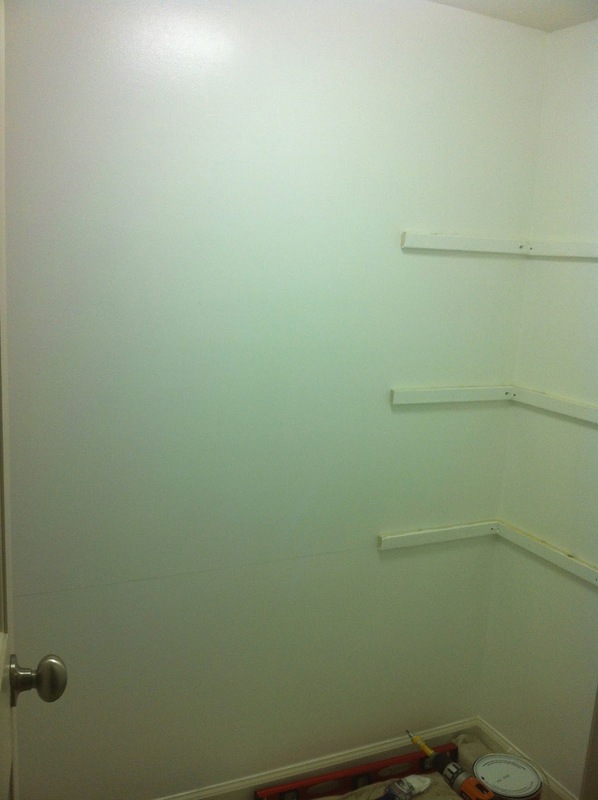 He cut the MDF boards and painted the pieces white so they would be dry the next day to install. Step 3: Shelves are built! Day 3: Installation/Organization - I was so excited to come home from work and see the project was complete! 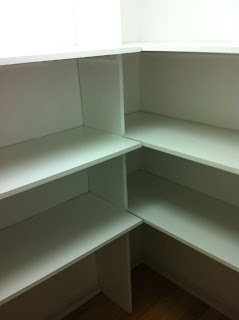 Aaron installed three shelves, leaving the tallest height for the top and bottom shelves. We had a plastic drawer container for loose items like party supplies, ziploc bags, and our reusable shopping bags. We store tall and heavy jugs like white vinegar that we use for house cleaning. 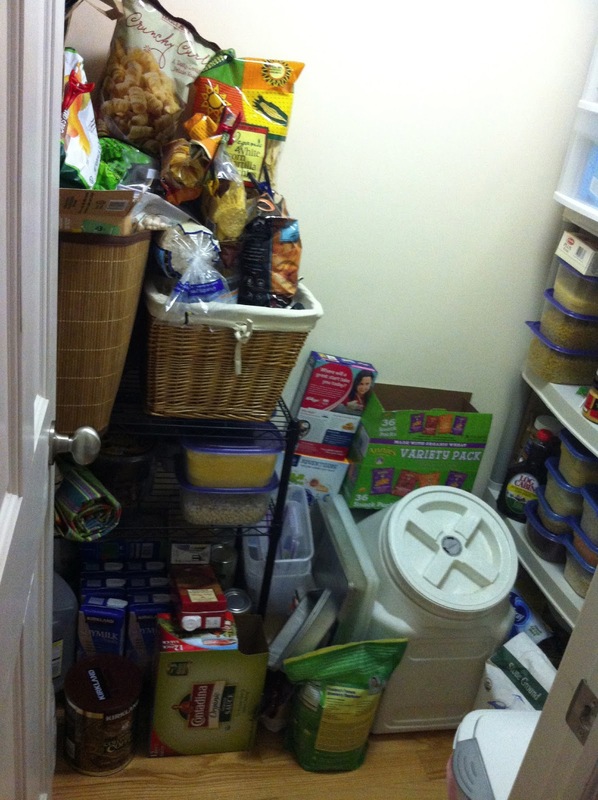 We use the second floor area for our recycling and dog food storage bins. Budget: The project was very affordable! Aaron used MDF instead of solid wood. But the white paint effect makes it look really nice. He bought longer pieces and cut them to his specifications. We bought a nail gun, but he will use that tool again for future project. In the end, we spent less than $200! It's well worth it! Having pantry items clearly visible and accessible makes it easy to do an inventory of what I have on-hand so I don't over-buy items. 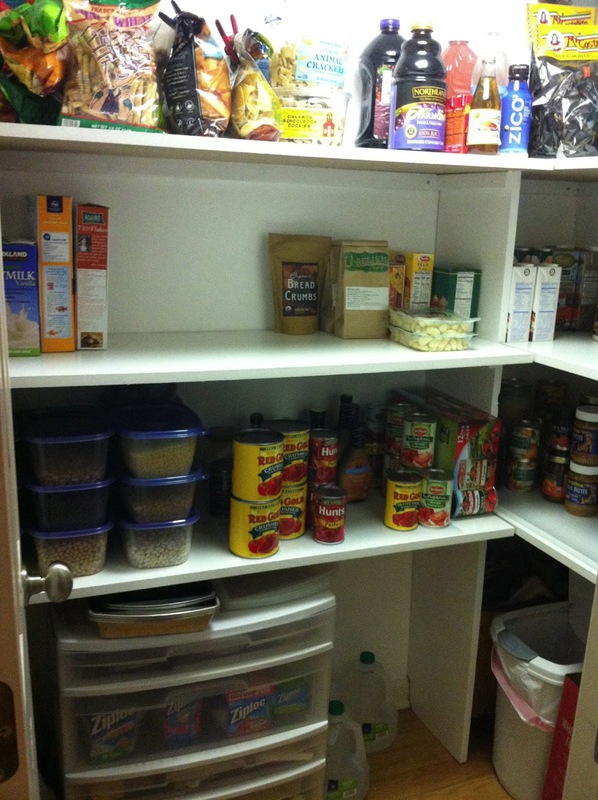 That's another way an organized pantry saves you money down the road. I'm thrilled with the finished project! 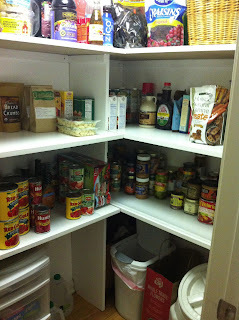 I love seeing the white space in the pantry and extra room! I'm definitely a happy wife! AFTER: View of open bottom area for recycling and dog food.